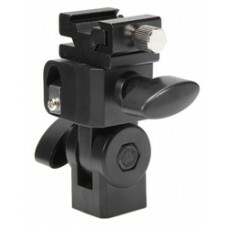 Product information "walimex Studio Clamp with Spigot"
Convenient helps in studio are always necessary. 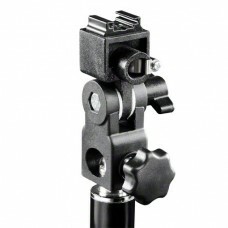 A particularly indispensable utensil is the Studio Clamp with 5/8 spigot: Herewith you can easily mount e.g. 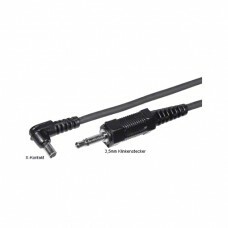 reflector holders, studio flashes or other accessories: Just clamp the sturdy screw coupling on the plate of a shooting table or on a tripod leg und you can mount your desired part on the 5/8 spigot with 1/4 inch thread without problems. 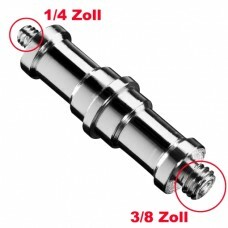 Product information "walimex Spigot 3/8 inch- 1/4 inch"compact 5/8 Zoll changeable spigotwith 1/4 Zo..
za pritrditev na stativ in palice do max. 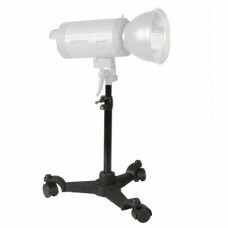 premera 3,5cmenostavno za montažo..
Vreče za obtežitev, primerne za obtežitev stojal, studijskih žerjavov.Fleksibilna razporeditev obtež..
Walimex flash and studio umbrella holders.Use your flash and make an improvised or mobile studio.the..